It can be difficult to grasp how nuclear weapons shape world events without confronting the cold, hard facts. There are an estimated 15,000 nuclear warheads on Earth, and the nine nuclear states that have them ran some 2,000 nuclear tests to produce them. Sky-high numbers like that get you part of the way. But to get a sense of the human side of things, it helps to be closer to the ground. Not easy when you’re talking about nuclear bombs, but an impressively immersive website launched this week offers a virtual shortcut. Nuclear Dissent presents an intimate, if narrow, history of France’s nuclear testing in the South Pacific and the ultimately successful attempts to stop them. Up until the 1990s, France performed nearly 200 nuclear tests on the French Polynesian atoll of Mururoa, about 750 miles from Tahiti. Protests by local activists and members of Greenpeace (which, in one of its earliest campaigns, stationed sailboats within the 12-mile exclusion zone around the test site) led New Zealand and Australia to bring a case against France to the World Court, and atmospheric detonations were halted in 1974. But they went underground and exploded another 150-odd devices beneath the water before finally quitting under intense local and international pressure in 1996—the same year they signed the Comprehensive Nuclear Test-Ban Treaty. Designed to work with virtual reality devices as well as standard web browsers, Nuclear Dissent presents this history in five “chapters,” each in turn organized around three parts: a traditional video documentary segment, an interactive 3D environment, and a photo gallery, some with archival audio recordings. The first three chapters center on the accounts of two Polynesian men who worked on the atoll and two Greenpeace activists who were instrumental in sparking international condemnation of the tests. Multiple standoffs shape the history, from the 1970s sail-ins to the bombing of Greenpeace’s Rainbow Warrior boat by French spies in 1985, and riots in 1995 that precipitated the end of testing. 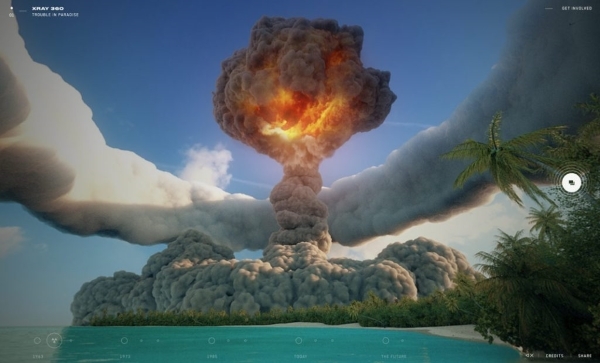 The final two chapters take up ongoing environmental and health problems caused by the tests (such as the potential collapse of the atoll, and lingering effects of radiation as far away as Tahiti), along with expert commentary on the persistent danger posed by nuclear weapons worldwide—ending with a tidy version of Alex Wellerstein’s NukeMap and a reminder of the current time). Funded by public broadcasting agencies in Canada and New Zealand, and promoted alongside Rainbow Warrior’s latest voyage to the South Pacific, the website offers only a partial look at France’s nuclear program in the region. The French are basically portrayed as one-dimensional villains, somewhat at odds with the rest of the 3D-enabled story. But you don’t turn to a platform like this to avoid subjectivity. The real value of the website, and its interactive elements, is how easily it turns an abstract history lesson into a personal view of an under-appreciated period of the nuclear age—one that continues to have harmful effects. After a while, stepping through each of the 15 chapter segments begins to feel like poring over the pages of a family photo album, with a couple of relatives and friends chiming in with their memories. Except the memories they’re talking about are multi-kiloton nuclear blasts. It’s easy to come away from Nuclear Dissent feeling a bit like you’ve travelled to Mururoa and know what it was like to live next door to a nuclear test site run by a European colonial power. Is that sense of authority justified? Can it be compared to scrutinizing the scientific and historical evidence? Probably not. But scrolling around a virtual Pacific atoll from 5,000 miles away, I think I know a little more about what was at stake during those experiments in mass destruction, and how they affected real people.